what drives him each day. Physical, emotional and environmental factors all play a role in determining our health. To get the whole picture of a person’s health, Dr. Rignell looks at all these factors. He evaluates each person as an individual and analyzes the results of each exam independently to determine the proper course of care, specific to the particular needs of that patient. One of the things that is most satisfying for Dr. Rignell is helping people get back to their lifestyle and the things they enjoy doing. For patients who are discouraged and frustrated, chiropractic is an excellent place to look for solutions. “Many patients tell me they wish they’d known about chiropractic sooner,” says Dr. Rignell. 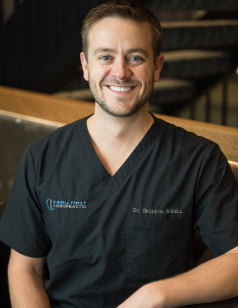 Dr. Rignell especially loves that people look forward to their chiropractic appointments. “It makes it fun for me and fun for my patients,” he says. I really felt like maybe I could feel much better again. AND I HAVE!!!! I absolutely love going to Dr. Rignell. He is always there to listen and to adjust me according to my needs. I would highly recommend Rignell Chiropractic to any of my Mankato area friends and family. Thank you for taking me in on short notice and at the end of the day! I left knowing that everything was eventually going to be okay because of the wonderful service. Thank you! Dr.Rignell made me feel very comfortable for my first time being to a chiropractor. I was nervous and he reassured me that he will explain everything in detail so I knew what was going on. Wonderful service and staff! All around excellent experience. I love the atmosphere and I feel very valued as a patient.